This month we hear more from Tall Tales Curator Liz Wewiora on how she first came to discover Beth Collar’s work and her journey through the Tall Tales programme. “I first had the pleasure of discovering Beth Collar’s work after a performance, Like Valhalla, at Rowing in London. We knew we wanted to invite a London/ South based artist to take up residence in Glasgow Women’s Library, whilst Glasgow based Ruth Barker headed down South and after seeing the performance at Rowing I just knew it had to be Beth. For me her work centres around pulling apart and piecing back together remnants of others’ stories. She plays with the line between truth and fiction within these tales, until she finds her own collective narrative to share. The work tends to presents itself somewhere between a performance and sculpture, with the sculpture often becoming the ‘prop’, the single object which guides the action/s of her performance. With this playful approach to both medium and story-telling, her response to the archives at Glasgow Women’s Library was one that filled me with curiosity and delight. In the Summer/ Autumn of 2014, Beth began her Tall Tales residency at Glasgow Women’s Library working over a 2 phased period, with a simple and open brief to respond to the Library and its collection in someway. With a hugely rich and diverse archive and a talented team of women at its helm, it is no wonder when Beth Collar started her residency at it was hard to know where to begin. I remember the first meetings with her in the library and email correspondences between us both, and how there were so many potential lines of investigation for her to explore further through the GWL archives. Where to start? Where to hone in? Conversations and investigations around LGTB zines, feminist articles and the women’s suffrage movement emerged with peaks and troughs of interest but what seemed to retain Beth’s attention throughout was a series of early feminist books including Naomi Woolf’s The Beauty Myth from 1990. I still smile when I think of Beth first mentioning the book, as I recall my own second year at art school reading the very same writing, which drove the focus and entire approach to my work created that year. Beth was struck by its topics, which although were raised by Woolf over 3 decades ago, are still very much relevant today. There is a lot of reference to the idealised look of a female in society, the importance of smoothness of a woman’s face and the cosmetic industry pushing for this fictional perfection that only beauty and youth will demonstrate a ‘true women’. Woolf’s book also reminded her of a really strong rumour that was in circulation when she was a child; that a certain skin-care brand contained aborted foetuses. A horrible idea indeed, but this rumour actually connected to previous research Beth had been looking into around witches and the age old story that witches ate babies. A rumour now that when you search on-line has its own life of stories, whether true or not, creating its own narrative of interest in society. This idea that the rumour becomes the story, rather that historical fact itself, is of particular interest to Beth and often underpins the core themes running through her work. Upon reflection and inspiration of her time with the Glasgow Women’s Library, for the Tall Tales tour, Beth has created a new sculptural, The Furrowed Brow, which has already exhibited at the Freud Museum London and Touchstones, Rochdale before finally making its way to its home of inspiration – Glasgow Women’s Library this October. 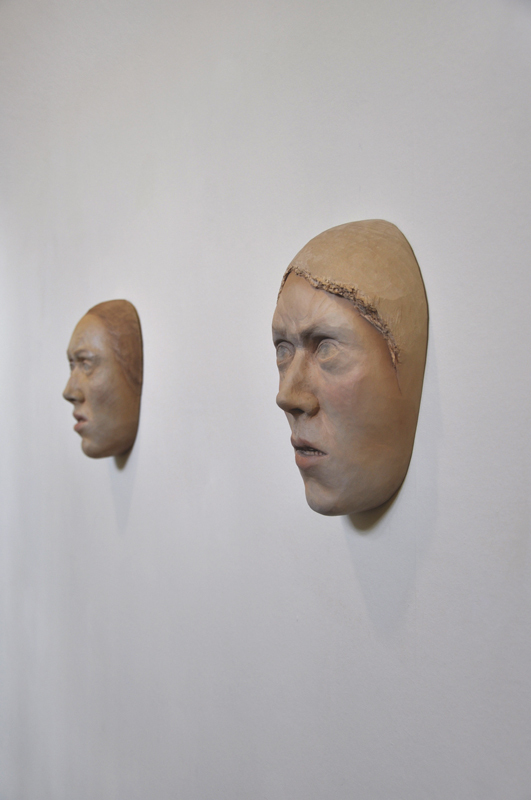 The work consists of two wooden carved sculptures of women’s faces; they’re almost like masks. They hang on the wall at eye level, peering outwards and directly at the viewer. The facial expression of is of a furrowed brow, with wrinkles on the forehead and if you have ever met Beth in person you would certainly suggest one might be a representation of the artist herself. Contemporary cosmetics are then used to smooth the surface of the face, however it is interesting to note the deeper lines of the lime wood used stubbornly show through – an interesting visual nod to this idea what we mean by surface expression, and facial expressions as meaning. The furrowed brow is often attached to an idea of the brooding hero in popular culture – a James Dean-like expression of thought but when appearing on a woman’s face, it doesn’t hold those connotations, but has a completely different set of meanings. This double standard the expression represents and double meaning conveyed within this shared expression was of particular interest to Beth. Alongside the Furrowed Brow sculptures, Beth will return to Glasgow Women’s Library bringing the project full circle, with a new performance. The piece will be performed on the opening evening, Friday 21st October at 7pm. The performance is set to respond specifically to and for the Glasgow Women’s Library, with particular references to their archive, a collection which resonates dearly in Beth’s mind. In a recent interview with a-n Beth mentioned ” Having undertaken it a couple of years ago, almost everything I have been producing since then has in some way been influenced by the literature that I discovered during that residency. That’s been the nice thing about the project being long term”. We can’t wait to bring Beth and her work back to where it all began, to Glasgow Women’s Library this October. Beth Collar studied at London Metropolitan University and the Princes Drawing School before completing her MA at the Royal College of Art in 2012. In March 2016, she won Standpoint Gallery’s Mark Tanner Sculpture Award 2016-17.